This is one of 16 "Grammar Songs" by Kathy Troxel. Lyrica: Comma Song MP3 from Grammar Songs CD by Kathy Troxel/Audio Memory Use a comma to separate items in a series if they're not joined by "and" or "or." You usually separate independent clauses in a series by semicolons. Use a comma to separate two or more adjectives if they come before a noun. When you join independent clauses, use a comma before: and, but, or, nor, for and yet. Words used in direct address - use a comma. Appositive, appositive phrases - use a comma. Parenthetical expressions - use a comma too. Use a comma to separate short independent clauses. That'll make it look all right. Use a comma for non-essential clauses and phrases. That'll help you do it right. Words used in direct address - use a comma. Appositive, appositive phrases - use a comma. Parenthetical expressions - use a comma too. Use a comma to separate items in addresses and to separate the items in dates. And at the ending of a letter when you sign it with love - That'll help you keep your mate. Words used in direct address - use a comma. Appositive, appositive phrases - use a comma. Parenthetical expressions - use a comma too. 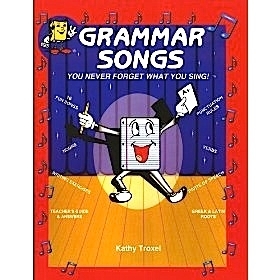 copyright 1984 by Kathy Troxel/Audio Memory Grammar Songs book and Teacher's Guide are sold separately. They include exercises related to the song, explanation of terms and answers to exercises.